Population labels have been placed in the (x,y) spot of the population averages. This corresponds -usually- to the midpoint of blobs of individuals from that population, but some populations have a few European-admixed individuals, and hence their population average is transposed. Consult the legend for color/point information for the 32 populations. 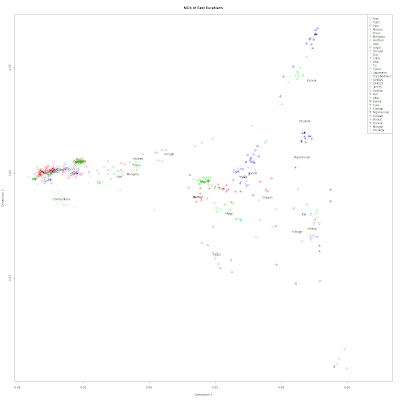 The most striking feature of this plot is the extreme homogeneity of the vast majority of East Eurasians. They may occupy a tiny blob on the left of the plot, but the various ethnic groups of China, the Japanese, and the Cambodians all appear to be very close to each other; indeed you can hardly see their labels in the mass of points. Here is a blowup of that part of the plot. 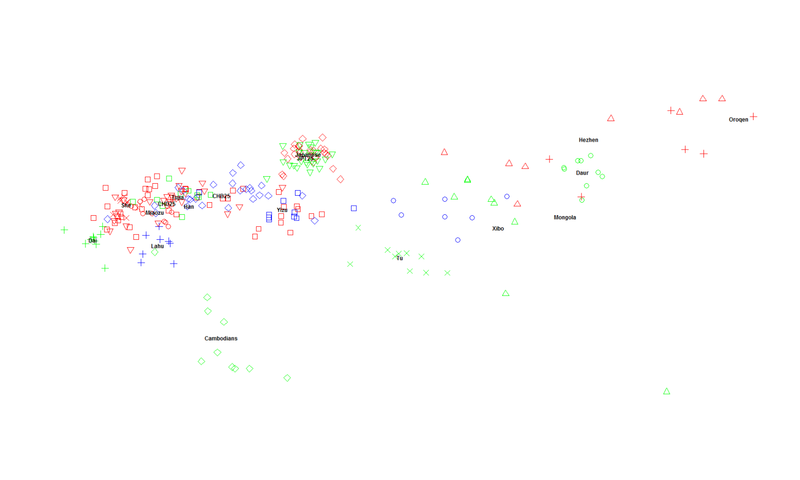 These dots represent the overwhelming mass of East Eurasians, and indeed the biggest single set of human groups. The scattering of populations to the right of the main MDS plot are, in comparison, demographically insignificant, some of them numbering less than 1,000 individuals. 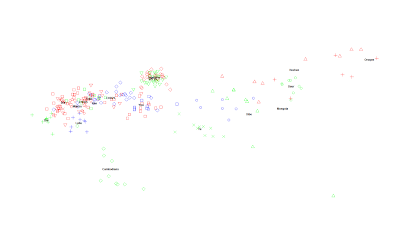 What this plot shows, in tangible form, is a picture of mankind's past: before the invention of agriculture, most humans lived in small tribes, scattered across the world. We can be fairly certain that the action of genetic drift and natural selection would have created a cornucopia of human diversity, with high between-group diversity due to high levels of genetic drift. Out of all this variety, some tribes of hunters made the transition to agriculture, growing in numbers, filling the areas they exploited, and expanding into new ones. The hunters were on their way to extinction, but new tribes formed at the fringes, those of pastoral nomads exploiting animals to thrive where neither farmer nor hunter could. In the world of farmers, with growing population densities and expansion came the breakdown of isolates: this led to a further homogenization of the farmers' gene pool, as different tribes that had adopted the new way of life lost all trace of their past tribal identities and formed new ones based on the common language of the agriculturalists and the new way of life. With more human bodies in the farming communities, came more novel mutations, and hence more of the raw materials of selection. Coupled with the new challenges of agriculture, for which man is unaccustomed to, the social challenges of living close to many others in villages, and, later, cities, the cognitive challenges of new symbolic systems of communication, selection further reduced diversity in key aspects of human appearance and behavior, while maintaining it, or even increasing it in others, such as resistance to pathogens. In western Eurasia this process was pushed to its limits, and there are virtually no nomads or hunters to be found there anymore. Africa was explored by Europeans just in time to find living hunters such as the San and Pygmies still in existence there. A few centuries more, and perhaps they, too, would have beeen absorbed into the mass of expanding farmers. The few dots of European- and Chinese-admixed individuals that deviate from their own populations are a reminder of what would have happened if genetic science had not arrived at the scene when it did. For better or worse, the odds are stacked against most of these peoples surviving as distinct entities. The numbers are against them, and, sooner, or later, they will be assimilated. In general small populations are more likely to change from one generation to the next because there are less "rolls of the dice" when the next generation comes so there is greater variability from the average (or preceding generation). Small populations are also more vulnerable to having large parts of their population wiped out which would also change the next generation. When you add the fact that the north Asian populations were more separated from each other than was Asians it makes sense that they would drift appart much faster. I agree with the dichotomy you present; that agricultural societies tend to be more homogeneous and neighboring hunter gathering populations will be more genetically distant. BUT KEEP IN MIND that Northern Asia is huge and the geographical distance between these northern Asian populations are also very big. So part of their non-homogeneity comes from the fact they they are separated by large geographic distances just like Cambodia is from Japan, an important difference is that there are populations in east asia to fill all the spaces in between. But even still the east Asians are pretty genetically close given their geographic distances; more so than north Asians. I can see the homogenization and assimilation - in part due to the numbers game - but I disagree with you on the importance of very recent selection. A disease here or there, folic acid vs. vitamin D, lactose intolerance, coping with overloads of salt and carbohydrates etc. may all be very important --- but they are mere specks in the overall genetic picture. Conversely, one may argue that people have essentially remained the same in the past 20,000 to 40,000 years. Just look at how close all Europeans are to each other, even though until recently they come from very different subsistence backgrounds, and things only got a bit inflated after LBK break-down - i.e., too recently given the variety or source populations. People have definitely not remained the same over the last 20,000-40,000 years. Appearance-wise at least, there has been a really obvious trend for a more gracile skeleton, more globular head, smaller face, smaller teeth, and the complete or partial depigmentation of many human groups. Going beyond the skeleton, we see DNA changes whenever we've tested ancient DNA across a few thousand years: different haplogroup frequencies, absence of near-absence of Lactase Persistence and HIV resistence alleles and so on. "The most striking feature of this plot is the extreme homogeneity of the vast majority of East Eurasians. They may occupy a tiny blob on the left of the plot, but the various ethnic groups of China, the Japanese, and the Cambodians all appear to be very close to each other"
That 'tiny blob on the left of the plot' is in fact centred on the region of the Yangtze/Yellow River Chinese Neolithic, although it includes Japan. The Cambodians are presumably very close to that centre because of the expansion southwards of people from that Chinese Neolithic centre. Presumably that genetic expansion was associated with one or more haplogroup expansions. My vote goes to the three O Y-haps for a start. Their distribution fits far better a northern origin, rather than a southern one. 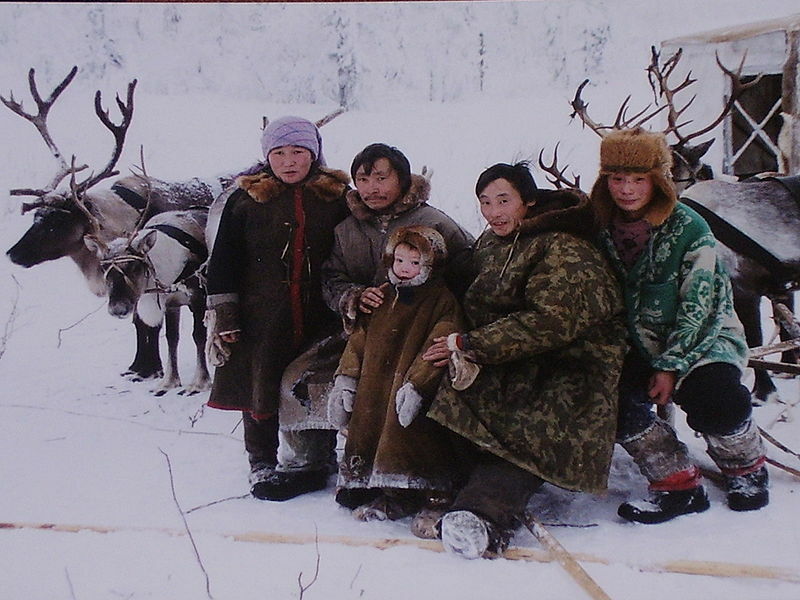 What about mtDNA haplogroups? To me the candidates are the SE Asian members of the N-derived haplogroups A, Y and N9a, although at his blog Maju has been arguing vehemently against a northerly origin for any of these mtDNA haplogroups. The SE Asian members of the M-derived mtDNA haplogroup C may also have been carried to SE Asia with the Neolithic expansion. 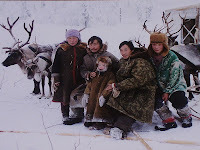 Perhaps also along with G.
There're 2 groups of the Mongol, "Mongola" samples should be the Mongols from Hulunbeir, Inner Mongolia where is near to Manchuria, while "Mongol" samples should be the Mongols from outer Mongolia. Haven't we found elsewhere that Cambodians have a substantial South Asian element?